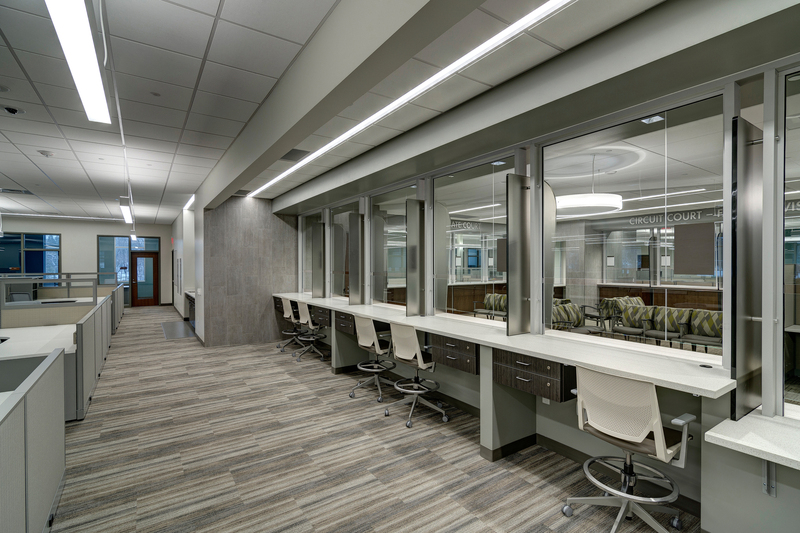 Opened in March, Michigan's new $23 million Gull Road Justice Complex improves operational collaboration through efficiencies in space, design and function. The 85,000-square-foot, three-story building also houses the family division of the Kalamazoo County Circuit Court. 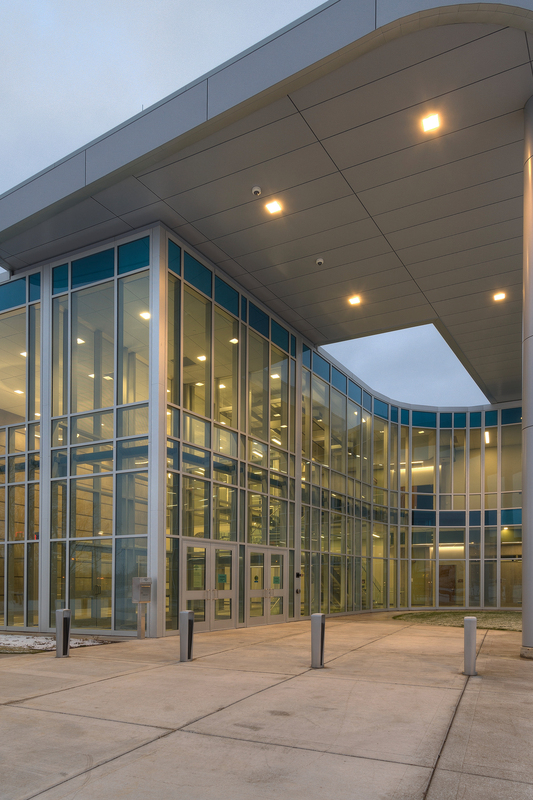 TowerPinkster worked with the County to design a facility that conveyed a transparency and connection to the community, while providing a secure and functional structure. Helping bring this vision to life and meet the multiple performance requirements, the architectural team selected numerous systems from Tubelite Inc. Working closely with construction manager AVB Inc., and Double O Supply & Craftsman, Inc. installed more than 14,400 square feet of Tubelite's curtainwall and storefront on both the interior and exterior. Double O also installed the entrance systems and exterior sun shades. 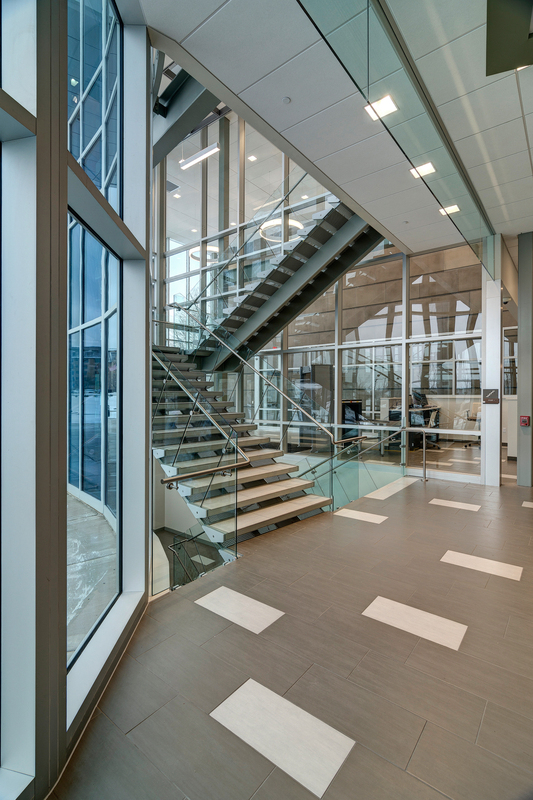 "Curtainwall is an important part of the design solution identifying the public realm of the building and to wash the lobby space with natural north light. The proceedings inside the building can be very stress filled and the introduction of natural light can aid in reducing the tension," noted TowerPinkster's project manager and architect, Eric Hackman, AIA. "Courthouses play a unique role. They must reflect the dignity and importance of the work performed within their walls, and at the same time they must provide space and accommodate the tools needed to accomplish that work," said Kalamazoo County Probate Judge Curtis J. Bell, according to the Kalamazoo Gazette. The new building consolidates a number of offices and departments, including the probate and juvenile courts, which previously were located in multiple buildings. 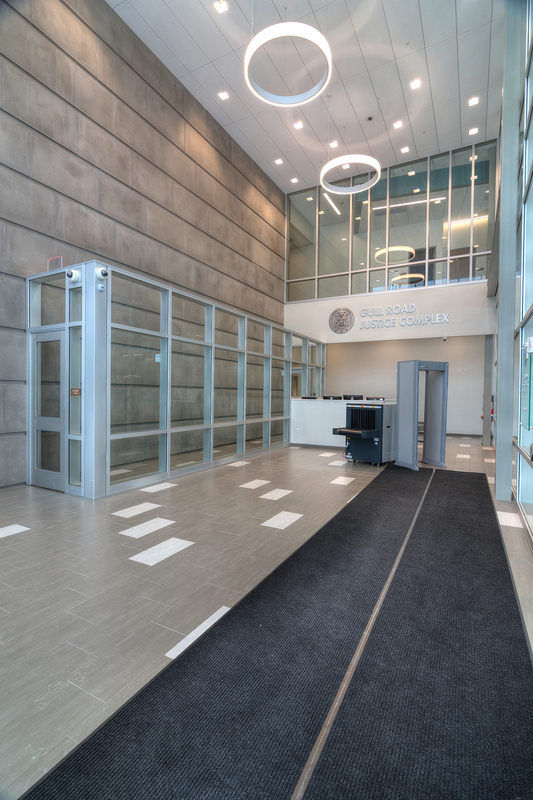 Constructed on vacant land, Kalamazoo County's new justice complex features judges' chambers, hearing rooms, courtrooms, holding rooms, and offices for the court clerk, Friend of Court and county prosecutor. An enclosed walkway connects the facility to the Juvenile Detention Center. According to TowerPinkster, exterior building materials were carefully selected to tie to the adjacent juvenile center, while blending with the surrounding neighborhood. To ensure the desired look and performance, TowerPinkster specified Tubelite's 400 Series curtainwall as the basis for design. Additional systems included T14000 Series storefront, Max/Block™ sun shades, E4500 Series (INT45) interior framing and Wide Stile Doors. As part of its overall contribution to the project, Tubelite's team provided the take-offs. Once approved, these drawings guided the manufacturing process for the myriad exterior and interior systems. "There's a lot of Tubelite systems on this project. It has a little bit of everything," says Neil Krumrei, an estimator and project manager with Double O. "We use Tubelite whenever we can." A self-described "old school guy," Krumrei adds, "I really like this project. I've been doing this for 35 years. From what I've seen, things went as well as could be expected for a project of this size. There's always something that doesn't go quite to plan, but we have good working relationship with AVB and Tubelite. It doesn't take long to make adjustments when needed." 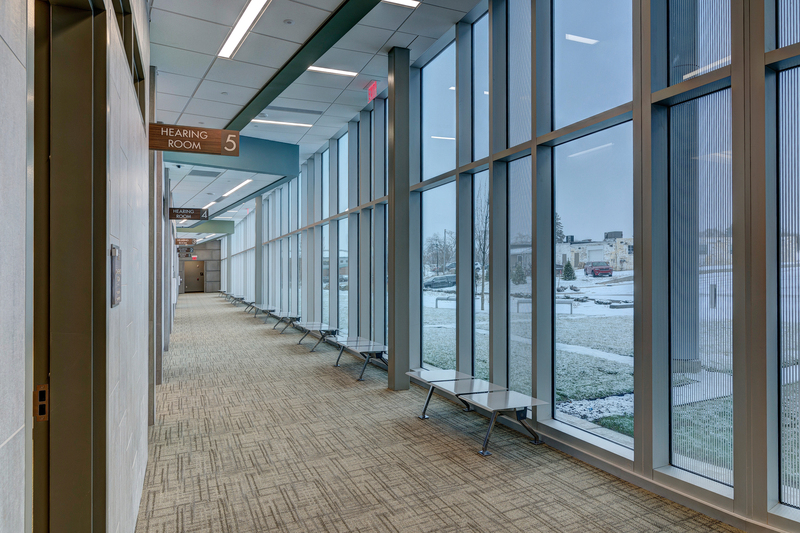 In Jan. 2015 with temperatures as low as 11ºF, Double O's glaziers began installing Tubelite's curtainwall and storefront systems to enclose the facility's exterior. Making installation as easy as possible, Tubelite's 400 Series curtainwall uses an exterior screw-applied pressure bar to secure the glass in place. In total, more than 400 glazing units were installed on the north elevation alone. The north and west elevations are wrapped in Tubelite's curtainwall with portions topped in clerestory windows created using Tubelite's 4.5-inch-deep storefront system. The main, north entrance features an 8-inch-deep curtainwall soaring up to 32 feet high and installed in angled segments to form a concave curvature. Walking through the front doors, the north lobby can accommodate up to 30 people. On the interior, the secured vestibules are comprised of Tubelite's 8-inch-deep curtainwall and 8-foot-tall Wide Stile Doors. Maintaining the natural light and security on the interior, Tubelite's interior framing system with security glazing creates a sense of openness for the Friend of the Court area. This is where services are provided to parties with minor children involving divorce, family support, interstate and paternity cases. "To provide a see-through separation, we installed E4500 as free-standing interior windows," describes Krumrei. "Horizontal open slots are carefully positioned to allow for documents to be passed through." A transparent connection between interior and exterior takes the shape of a 52-foot-tall staircase tower formed with Tubelite's 8-inch-deep curtainwall on the south elevation's mostly brick exterior. A small portion of the ground-floor uses the same system. Throughout the south and east elevations' brick exterior, large openings allow for daylight and views. Most of the openings are 4 by 8 feet with some as large as 8 by 8 feet. In each is installed Tubelite 4.5-inch-deep storefront fitted with a 20-inch airfoil sun shade to manage unwanted solar heat gain. Cooling costs can be significantly lowered with sun shades, while still allowing natural light to fill the workspace. Further supporting occupants' comfort and heating and cooling cost savings, the PPG Solarblue® glass in Tubelite's systems helps in lessening the demand for electric lighting and reducing HVAC loads. Fabricated into insulated glass units by Thompson I.G., the sparkling, light, sky-blue appearance balances high visible light transmittance of 50 percent and a solar heat gain coefficient of 0.49. Security glazing also was used at the ground level and in designated areas. Along with contributing to a safe, energy-efficient and stylish facility, Tubelite's systems are finished for long-term durability with minimal maintenance. Linetec finished all of the aluminum framing, doors and sun shades in a Class I clear anodize. The resilient finish will protect the justice complex's metal framework and preserve its appearance for many years to come. Installation of Tubelite's systems on both the exterior and interior was substantially completed by Dec. 2015. Following a dedication ceremony in Feb. 2016, the facility was operational in early March. The project was delivered on time and budget. * Photos provided by: Double O Supply & Craftsmen, Inc. and AVB Inc. Filed under: Linetec, Projects, Tubelite Inc.